Lily hasn't spoken a word in two years, since her older brother died. 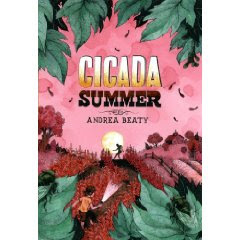 But in the summer when a girl named Tinny came to town and the cicadas came out of the 17 year hibernation, things will change. Lily will reveal some talents she's learned from Nancy Drew and confront both her past and the injustices that pervade her world. A beautifully written and lyrical look at a summer of change. Perhaps too lyrical and abstract for the targeted tween audience, but a gorgeous and gentle read nonetheless. This short novel (almost a novella) has delightful descriptions and the type of bittersweet poignancy that I'm a sucker for. Recommended.